Too funny. I love that the writers went the extra mile and did their homework when they could have easily just made names up. Huh — maybe they thought Feringa was also a funny name? 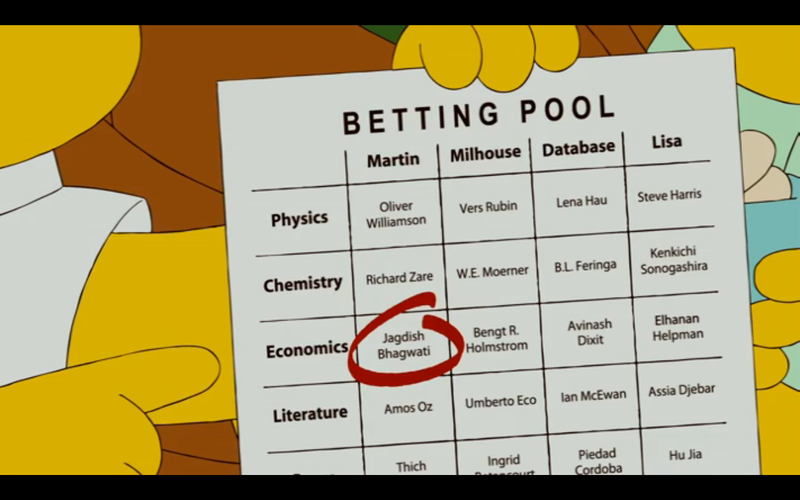 yea…..i agree with Simpsons prediction!!!………Prof. Ben L Feringa deserve to get Nobel Prize for his pioneer work in Molecular Machines. I would like to comment on Dr. Smalls. So please Dr. Smalls before saying the writers looked for a geek, do your homework like the writers did. Teichert, J.; Feringa, B. (2010). “Phosphoramidites: Privileged Ligands in Asymmetric Catalysis.”. Angewandte Chemie (International ed. in English) 49 (14): 2486–2528. but a nobel prize.. seriously? no way. I’m sorry, but I don’t buy Nobel Prize Winner for feringa..
I’m not saying he should win it this year. I only wanted say that Dr. Smalls was not right saying he worked in proteomics. I agree with you that a real chemist should win the Nobel Prize this year. My personal favorites are Heck, Suzuki and Sonogashira (or Negish? or Hartwig?) all for their Pd-couplings. They should be recognized for these very useful contributions to organic synthesis in the lab and also in the chemical industry. Bill Odenkirk, longtime writer for the Simpsons, is a PhD chemist (http://en.wikipedia.org/wiki/Bill_Odenkirk). I’ve always thought that this is why Burns bears such a strong resemblance to Lippard.